Have you ever had a car burned into your memory? Believe it or not, an old Chevy Beretta had that effect on me. But it wasn’t just any version of GM’s L platform coupe – it was a Beretta Indy Pace Car replica. That’s why when I spotted this one here on eBay, I immediately thought back to the Anaconda Sports store in my hometown of Poughkeepsie, New York, where an employee parked it far, far away from any other car in the lot. 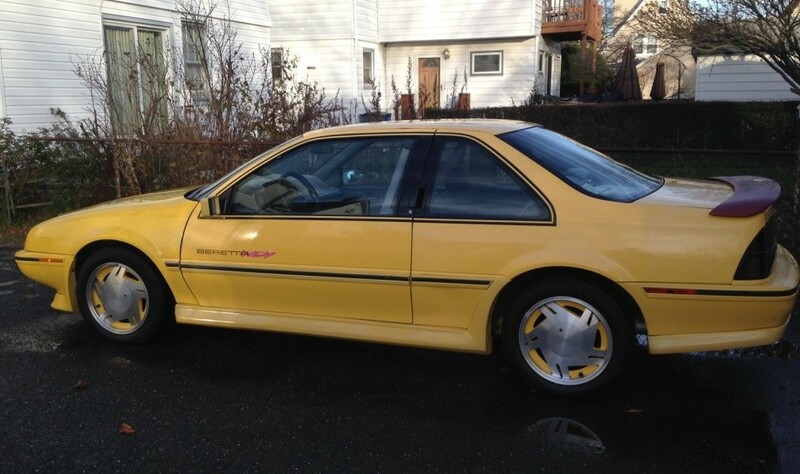 It was also yellow but looked a lot better than this one, which is suffering from paint damage and a mismatched-spoiler on the rear deck lid. It’s worth bringing this one back, since only 7,500 Pace Car editions were made and the majority were teal in color. Clean up the paint and get the included decals applied, because this limited production Beretta would be easy to own. Wife had a Beretta GT when we first met, and I became the car’s daily mechanic. Was a pretty good car, with the only real problems being a dead ignition module, and one time a hinge pin sheared, allowing the driver’s door to fall off! That would be a Z34 – Cavalier was a Z24. Quad 4 is a great, great engine. Lots of torque! 1,500 yellow cars made, rest were teal.